Pool ownership can provide limitless enjoyment for a homeowner as well as friends and family, especially during the summer when that clear, refreshing water is most especially enticing, but it also comes with the responsibility of providing a safe environment for everyone to enjoy. Every pool owner (and visitor) should be informed on how best to prevent accidents and what to do in case of an emergency. We’ve comprised a list of some basic steps you can take to reduce the risk of accident or injury. Your pool should be completely surrounded with a fence that is at least 4 ft. high, and has a self latching gate that closes automatically. Keep a safety cover over the pool at any time it is not in use, and remove any ladders used to access the pool if possible. Consider investing in a pool alarm, which will alert you any time anyone enters the pool. Knowing something is wrong immediately could be the difference between life and death. Chidren should always have appropriate supervision at ALL times. Keep a responsible adult on watch duty, and if you need to step away, call everyone out of the pool first and secure the pool until you are able to return. 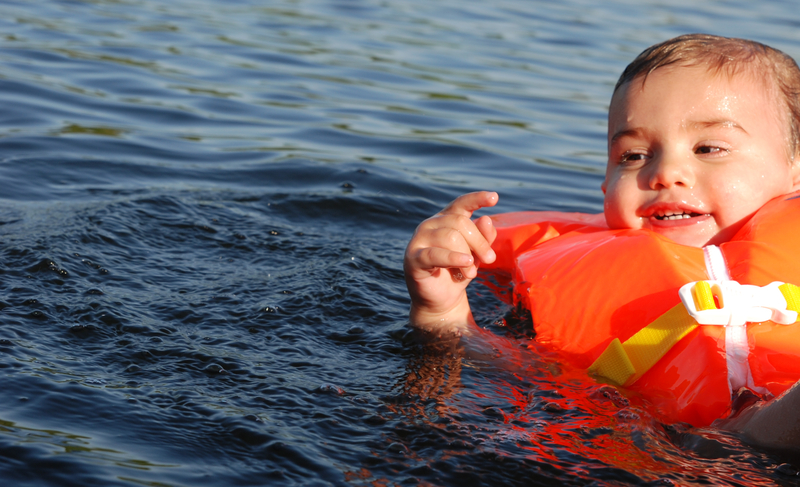 For young children, especially those who don’t know how to swim, should never be more than arm’s reach of an adult, and should be wearing a U.S. Coast Guard-approved life vest. The Red Cross, YMCA, local parks and recreation centers, or private lessons are all possible sources of swimming lessons and water safety courses. Find a location and program that works for you and teach anyone who will be using your pool regularly to swim as soon as possible. Standard survival skills include being able to return to the surface when the water is over your head; float or tread water for one minute; turn around in a full circle and find an exit; swim 25 yards; and exit the water without a ladder. Choose a careful list of rules and be sure everyone follows them at all times, whether in or out of the water in the pool area. This can include things like “No running,” and “No diving,” as well as other rules you may feel appropriate. Teach children that swimming is a privilege they earn by following the rules, and stay firm about enforcing them. Water wings, swim rings, and other flotation devices can provide a false sense of security. Some even decrease a child’s mobility, making it harder for them to get or stay above water, and you should be aware of the benefits and drawbacks to any such device you introduce into the pool. Pool toys and flotation devices should never be left in or near the pool when not in use, as a child may be attracted to them and try to enter the pool area to retrieve them. Everyone in the home who is able to (especially if they will be supervising children) should take courses and know what to do in the case of an emergency. Keep first aid supplies where they are easily and quickly accessible when using the pool. If you don’t have a place to keep them in your pool area, packing a beach tote or basket with a first aid kit and keeping this with you when you go out to the pool can eliminate the need to go find something after it’s already needed. Throwing in some other useful things, too – sunscreen (with SPF 30 or more) and shades, or goggles, for instance, that just STAY in the bag can help you remember to grab it as you go out the door.